Alternatively referred to as the counting frame, an abacus is a mechanical device used to assist a person in performing mathematical calculations and counting. Why was the abacus used? Before computers, calculators, or even arithmetic using paper and pencil, the abacus was the most advanced device for crunching numbers. Before the abacus, the only methods people had to use for their mathematical calculations were their fingers and toes, or stones in the dirt. Is the abacus still used today? Yes, even today in certain parts of the world the abacus is still used as a primary counting device or as a backup to more modern counting devices. Why should I learn or teach the abacus? Learning to use the abacus helps teach you a new way of counting and how to add and subtract using complementary numbers. By learning to solve problems in new ways, you can come up with better and often easier solutions to all sorts of problems. Before learning to use the abacus realize that there are many different types of abacus'. For example, the classical abacus or Chinese abacus has five beads on the bottom and two beads at the top. The modern abacus, Japanese abacus, or soroban has four beads at the bottom and one bead at the top. 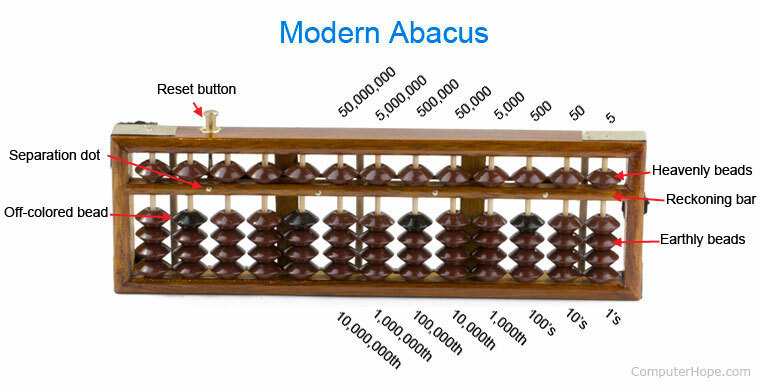 We are using the modern abacus for examples on this page. The upper beads upper beads are called the "Heavenly beads" and are worth five in the first column. The lower beads are called "Earthly beads" and are each worth one in the first column. When moving a bead towards the middle bar (called the reckoning bar), it is considered counted and when no bead is touching the reckoning bar that column is equal to zero. The separation dots and off-colored beads vary depending on the abacus, but are always used to separate numbers into sets of three. These markers can also mark your first position if you do not want to start counting from the far right. The beads values start in the far right 1's column, which are beads valued between 1 and 9. Going from right-to-left the beads values increase to the 10's place, 100's place, 1,000th place, etc. To use the abacus lay it on a flat surface and set it to zero by making sure no beads are touching the reckoning bar. If you have a reset button, press it to reset the beads. To count on the abacus start on the far right side of the abacus, and slide one earthly bead up to the reckoning bar using your thumb. One bead touching the reckoning bar makes the abacus equal 1. Slide three more beads up makes the abacus value four (3 + 1 = 4). Because the modern abacus only has four Earthly beads, if you want to count to five, you must move the heavenly bead down to the reckoning bar using your index finger. At the same time, move all Earthly beads down. If you wanted the total to be seven, move two earthly beads up to the reckoning bar (5 + 2 = 7). To count to higher numbers move further left depending on how high you want to count. For example, in the picture to the right, the abacus is equal to "283" with nine beads moved towards the reckoning bar. The third column (100's column) has two beads counted for 200. The second column (10's column) has a Heavenly bead counted for 50, and three Earthly beads counted for 30 giving it a total of 80. Finally, the first column (1's column) has three beads counted. Adding all columns together (200 + 80 + 3) gives you the total of 283. How do I add using the abacus? To add on an abacus each number is added to the abacus going left-to-right. For example, if we wanted to add 200 + 123 move two Earthly beads in the 100's column towards the reckoning bar for 200. Next, add one Earthly bead in the 100's column for 100, 2 Earthly beads in the 10's column for 20, and then finally three beads in the 1's column for three. Once completed you should be able to count 323 on the abacus. What if there are not enough beads to add in a column? Whenever you run out of beads, you need to use complementary numbers. See thecomplementary number section for further information and a list of complementary numbers. How do I subtract using the abacus? Simple subtracting on the abacus is much like adding on the abacus, put your first number in and then subtract from that number going left-to-right. For example, if we wanted to do 200 - 100, add 200 to the abacus by moving two Earthly beads up in the 100's column then subtract 100 from the 100's column to get a total of 100. What if there are not enough beads to take away? If there are not enough beads to take away from a column use the complement number of what you are trying to subtract. See understanding complementary numbersfor further information and examples. Generally speaking, "complements" are any two numbers less than ten that, when summed, add up to ten. They are used in calculations involving more than one column. It is crucial that you memorize the five sets of complementary numbers contained in the box below. They are essential if you want to do all forms of addition and subtraction on an abacus. Below is a listing of steps on how to add numbers together using an abacus. We have broken these steps into bullet points to make them easier to follow. Tip: When adding, if the column does not have enough beads subtract the complementary number from the column and add one bead to the column to the left. Note: Many of these examples you can probably do in your head. However, following the steps using your abacus demonstrates all of the required steps. Set the abacus to 4. Subtract 3 (the complement of 7) Earthly beads from the 1's column. Add 1 Earthly bead to the 10's column. The total should be 11 (10+1=11). Set the abacus to 7. Subtract 1 (the complement of 9) Earthly bead from the 1's column. The total should be 16 (10+5+1=16). Set the abacus to 19. Subtract 4 (the complement of 6) Earthly beads from the 1's column. The total should be 25 (20+5=25). Set the abacus to 22. Subtract 1 (the compliment of 9) Earthly bead to the 1's column. The total should be 31 (30+1=31). 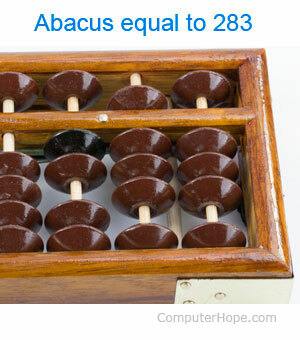 Below is a listing of steps on how to subtract numbers together using an abacus. We have broken these steps into bullet points to make them easier to follow. Tip: When subtracting, if the column does not have enough beads add the complementary number to the column and subtract one bead from the column to the left. Set the abacus to 10. Add 4 (the complement of 6) Earthly beads to the 1's column. Subtract 1 bead from the 10's column. The total should be 4. Set the abacus to 40. Add 2 (the complement of 8) Earthly beads to the 1's column. The total should be 32 (30+2). Set the abacus to 83. Subtract 2 beads from the 10's column. Add 5 (the complement of 5) Heavenly bead to the 1's column. The total should be 58 (50+5+3). Set the abacus to 62. Add 1 (the complement of 9) Earthly bead to the 1's column. Subtract 1 bead from the 10's column. To do this, since the 10's column equals 50 with the Heavenly bead, subtract the Heavenly bead and add four Earthly beads. The total should be 43 (40+3). Set the abacus to 392. Subtract 1 from the 100's column. Add 1 (the complement of 9) Earthly bead to the 10's column. Add 5 (the complement of 5) Earthly bead to the 1's column. The total should be 267 (200+50+10+5+2).